New legislation to make it compulsory for fishermen to wear lifejackets should be prioritised, marine accident investigators have said. The Marine Accident Investigation Branch (MAIB) made the recommendation following the deaths of four men. The deaths include two Scots fishermen, Craig Reid, 25, from Inverness, and Gerard Gillies, 42, from Vatersay. 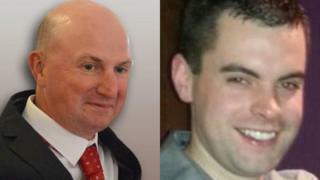 The other two men - Gareth and Daniel Willington - died when their boat sank off the Pembrokeshire coast. It is known that three of the four men involved in the incident were not wearing lifejackets. The Maritime and Coastguard Agency has already made a recommendation calling for the wearing of lifejackets to be made compulsory. However, the MAIB said the agency should make arrangements to prioritise the introduction of legislation requiring the compulsory wearing of constant wear lifejackets, or personal flotation devices (PDFs), on the exposed decks of all commercial fishing vessels. Mr Reid was lost overboard from the Apollo off Orkney in April this year. Mr Gillies died after falling overboard from the creel boat Annie T in the Sound of Mingulay in the Western Isles in October last year. Father and son Gareth Willington, 59, and Daniel, 32, from Carew in Pembrokeshire, died after their boat The Harvester sank off St David's Head in April this year. The body of Daniel Willington has not been found. Derek Cardno, safety officer for the Scottish Fishermen's Federation, said his organisation was "not convinced" that making the wearing of lifejackets a mandatory requirement would improve safety. He said: "We are tremendously saddened by these recent deaths and we, as an industry, are working on a number of initiatives to enhance fishermen's safety. "This includes an industry-led a scheme to supply free personal flotation devices (PFD) to every fisherman in Scotland, which has had a strong uptake. "We are not convinced that making the wearing of a PFD a mandatory requirement will make the sole difference that is required. "We believe it is much better to focus on education and creating a new mind-set among fishermen."